Have you found an online vendor selling Bacardi 1909 Superior Heritage Limited Edition? Bacardi 1909 Superior Heritage Limited Edition rum is based on the original design from 1909. It was produced by Bacardi Y Compañia S.A. de C.V. at the Destileria la Galarza in Mexico under the close supervision of José Sanchez Gavito, Maestro de Ron Bacardi. It has been certified as meeting the flavour profile of the first blending in 1862. If this is the white bacardi from 1909 i truly wonder what mistakes they made to make it into what white bacardi is now.. you can drink this straight, oke still not the best white rum but way better than the regular white nowadays! Please read this bacardi 😜 and make more of this! Hecho en Mexico, not Puerto Rico, this rum has a nice flavor composition that has mimicked as close to the original recipe from the early 1900’s. With a strong Cuban influence, this rum has a fairly complex flavor that can be sipped neat, though mixing would be your best bet. I like that this is a limited edition from Bacardi without having to pay $100 for its Reserva Limitada. It was very hard to track this bottle down. This is significant jump above the typical Bacardi Superior. Really love the mouthfeel, which is far more velvety. I would almost go as far as to say this is medium bodied, complimented by a very pleasant fragrance. I could sip this all day, and would happily use this as my primary daquiri rum. 44.5% ABV. Plenty of rubbing alcohol on the nose. It's hard to get past that. Fortunately, it dissipates after 10 or 15 minutes, but still pops its head up periodically (I even got an ammonia note from it at one point). Very sweet on the palate. A bit cane-y. Fruity, mango-like finish. Grapefruit as well. Based on reviews I'd seen, I had higher hopes for this one, and it's a bit of a let-down. The nose reveals a lack of care for the distillation process, and it is rather sweet. The flavor itself isn't bad, though, and I bet it'd make a killer Daiquiri. It's really not a terrible package, and could be attractive at the right price (if it were still being made). At the end of the day I think Bacardi accomplished what they set out to create, and it kicks the pants of anything else they're currently making, but it's still not a "great" rum. P.S. Curiously, doesn't say 1909 anywhere on the bottle...says 1888. There must have been some external marketing around this. Love this in a mojito or daiquiri. I use this rum when making the barcardi recipes for the mojito or daiquiri and it blends in great. The little extra alcohol percentage gives it a nice kick. 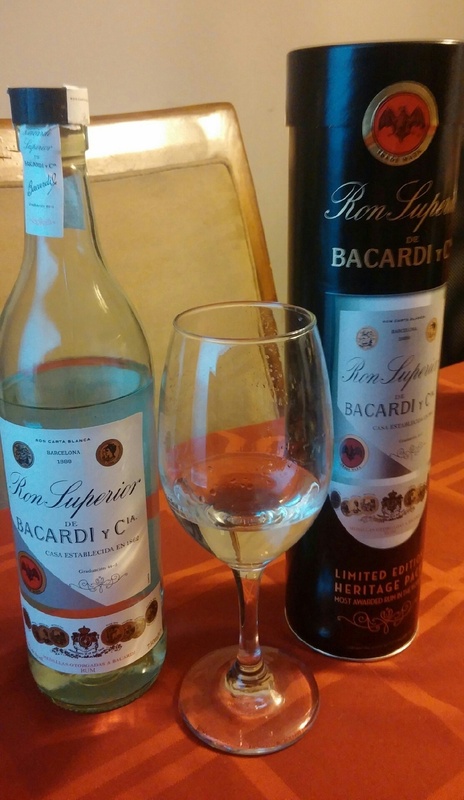 Bacardi as it was originally made, or as close as modernly possible. A bit more going on than the Silver tastewise. Clean, crisp, smooth, citrusy, and dry. From Mexico (not Puerto Rico) where the 8 is also made. It's over-filtered like all of their rum, but this one has retained a bit more than usual. I was pleased to find a stash of the limited edition at regular Superior prices at my local store. It's been my go-to for daiquiris and I think it provides a great quality flavor with a nice kick of alcohol. The bottle also has a great look to it that impresses guests. At 44.5%, this is a stronger (and better) version of the Bacardi Superior (40% abv). Very smooth, but as a light rum, it lacks the flavor of other rum styles. It's a good light rum, though not as good as other light rums such as the Vizcaya Cristal or the Diplomatico Blanco. Made in Mexico. My very first experience with drinking Rum. I found it to be smooth and refreshing plus it leaves you feeling relaxed without a hint of having been drinking. It is because of this Rum that l became a rum drinker. Slightly firmer due to the higher proof. This is great to add to cola and a slight improvement over the bar classic. This rum to start is made in Mexico and is 89 proof vs the bacardi from Puterto rico. This is made differently and you can tell from the moment it hits your lips its got a great sting to it at first. This rum is an excellent choice. Its surprisingly great as a straight sipper/shot rum. The flavors are light with a bit of backbone and come on then quickly fade as it enters your throat; there is little to no detectable burn. This is a rum that tastes like rum and replicated what it was like in 1862. I suggest everyone try this one before its gone its only a few more dollars than regular superior around here. I can't give this rum less than an 8.5.